In Finland, this spring we will have two major elections: parliamentary elections in April and as all others, EU Parliament elections in May. The political Parties are busy in preparing material and standpoints for the elections. In all countries where the Greens are a political Party, it has been known as a Party for the young. 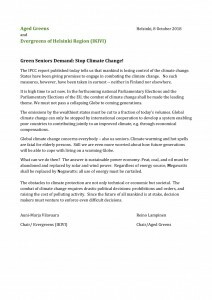 We, the aged Greens in Finland, wanted to remind the members of our own Party as well as the other political Parties that also we elderly are concerned about the climate change. We distributed this text to the other Parties and media. And, on purpose, the day when IPCC published its request to keep the warming under 1,5 degrees. 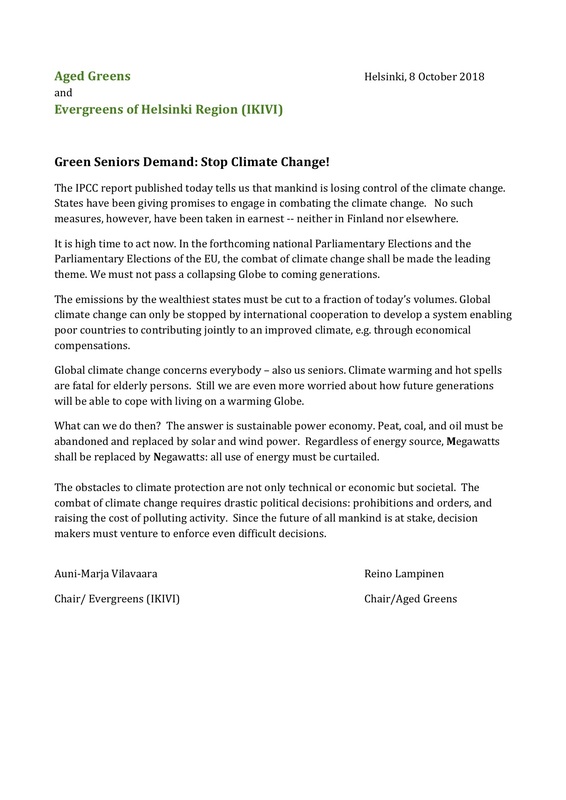 Following the fringe meeting in Antwerp we wrote a letter to the Chairs of the European Green Party as well as its Secretary General. The contents of the letter is self-evident – we remind this Party of young that the elderly also matter. At least they are crucial for the success of Green Parties, in EU Parliament elections and also in national elections. 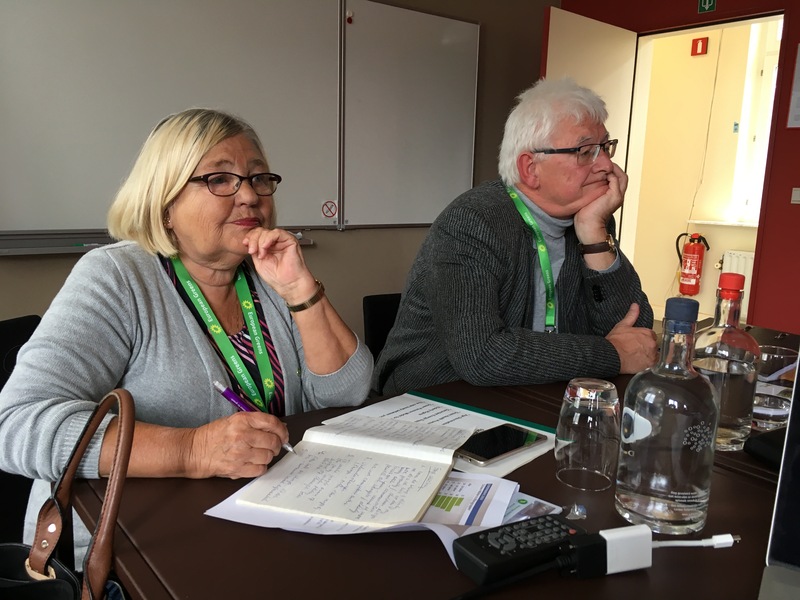 During the latest EGP Council meeting, 19 May 2018 in Antwerpen, the European Network of Green Seniors (ENGS) arranged a fringe meeting under title ”How to inspire more elderly to vote Green in the EU elections”. Frank Hauser, our Secretary General, presented the situation in certain Member States in most recent European elections. 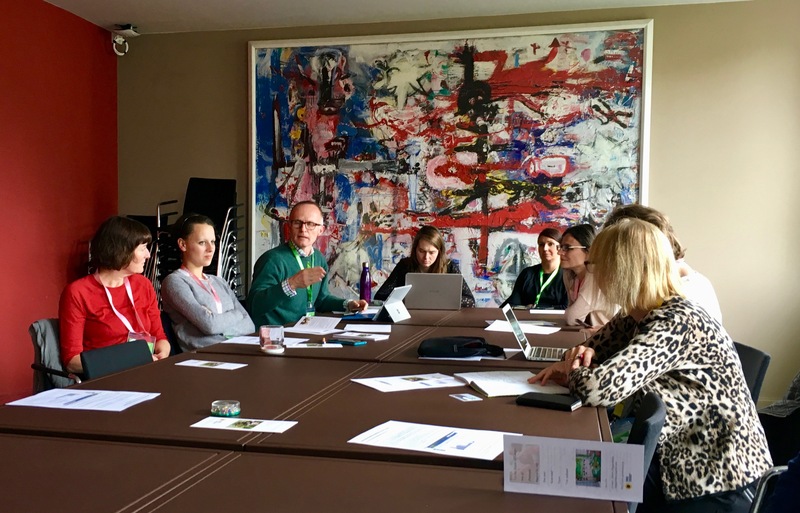 The presentation as well as the notes on the discussion after that can be found from ENGS site http://www.greenseniors.eu/. 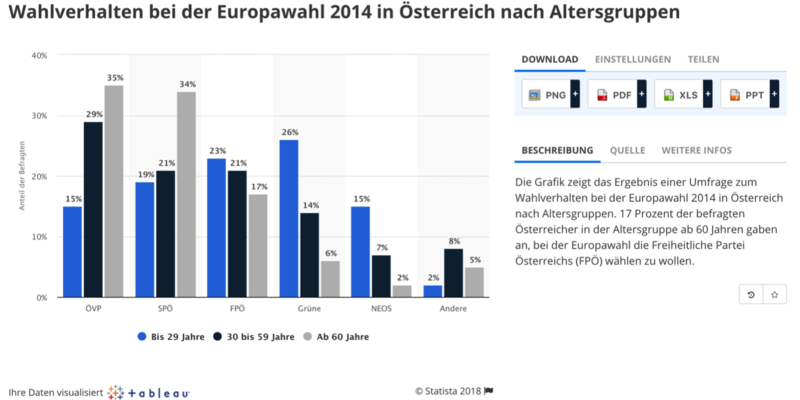 The situation in all Member States seems to be similar: the young vote more eagerly for the Greens, while the elderly seem to choose other Parties. And this is not enough: in almost all Member States the population is ageing, and the demographic trend continues in the future. These trends reinforce each other and together they are dangerous for the Green movement. − access to health care – at home, nursing home or hospital? − generation policy empowered by both young and old. If needed, ENGS would be happy to help EGP in these endeavours. 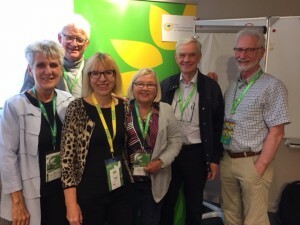 Altogether 16 people attended the meeting, 10 visitors and 5 ENGS Board members (Vivianne Gunnarsson, Frank Hauser, Birgit Meinhardt, Kris Fierens and Reino Lampinen) and as guest: Stefan Nilsson, member of the national Parliament of Sweden and a member of the Parliaments social and health committee. 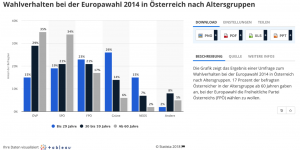 − European employment strategy, targets and initiatives. Discrimination of elderly in the job market has not been really highlighted by the EU or EGP. Vivianne stated that in EU pillar of social rights only one of four main titles includes age. Also the EGP resolution adopted in Liverpool only touches the discrimination of elderly. Stefan Nilsson, Sweden, MNP member of national parliament continued on a Swedish study on reasons for discrimination in the job market. Disability was found to be the main reason for discrimination while the high age is the second important. There are also differences in the interaction between age groups. He recommended that at least in Sweden word “årsrika” (“rich in years”) should be used instead of “elderly”. The age limit 55 as a reason for the unemployment of the elderly is gradually moving towards 45 years – ever younger have great difficulties to get a new job if unemployed. The continuously rising share of pensioners of population and rising numbers of unemployed people both lead to problems in financing pensions. There are differences between countries. From audience: there are great differences even between regions inside a country – between rural areas and cities. Nilsson also remarked that the Swedes get every day 3,5 h more living age – that means 1 h/week or 52 h/year, i.e. more than two days more living age every year! In Sweden there is already flexibility in the pension system. The more you work and the more you earn the bigger pension you get. It is possible to get a pension at 61 or you can wait until 65, the general pension age, but you also have the right to work until 67. A new pension agreement will probably enter into force from 2018. The pension age will then be 66 years and in 2020 it will be raised to 67 years with the right to stay until 68 respective 69 with the same employer. Public employees, both governmental and community employees, must have reached 30 years of service for a full pension. There is at the same time lack of jobs and lack of workforce. From the audience: maybe more demand of experienced folk. Frank Hauser: when the age increases, then the years of unemployment lengthen for those who are unemployed. This is dramatic for those who know that at 50 years they’ll have next 15 to 25 years of poverty. One reason for unemployment for the elderly is the wage level: the elderly request 25-30 €/h when the young may be ready to work for 10 €/h. From the audience (UK): solution would be minimum basic income. Old women are a huge resource for the society even if they are not paid. 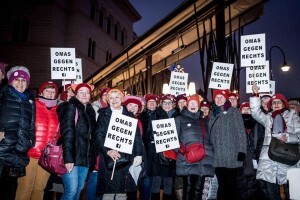 From Sweden: the pension for public sector workers is very close to the poverty line in the EU. (which is about 1400 Euro). Also in these cases the solution would be minimum pension. Discussion of basic income is more ore less dead in Sweden although many green party members still want to put it in place. − In Finland a trial is going on. For 2 years, 1 January 2017 to 31 December 2018, a 560 € a monthly basic income will be paid for 2000 unemployed people without conditions or substitute. The trial will be lead by the Social Insurance Institution of Finland. It selected the group as a random sample from unemployed people. A follow-up study will be done 2019. This 2000 person group will be compared to a group of other unemployed persons, in total 173 000. This study will look at e.g. the difference in employment between these two groups during and after the trial. − In Netherlands different cities test different models. 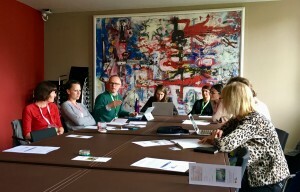 − Also GEF (Green European Foundation) is studying different models for minimum basic income. From the audience: The pension age should be adjusted accordingto the heaviness of the work – heavy work, lower pension age. Today the work might be more stressing even when the work is not physically so heavy. So the heaviness here covers also stressing mental jobs. This stress might cover also nurses, teachers etc. There is also need for pension at very low age due to illnesses. As a conclusion: chronological age is not a good basis for pension. There are big differences in the minimum pension age: even from 50 to 55 in some Mediterranean countries. Even bigger differences between continents if you think of e.g. Africa! Older workers and their experience are also a threat on the employer: they might know better than their younger bosses. But a positive remark: wisdom and experience of the elderly might be asked for in the future! Finally we had a lengthy discussion on voluntary work: is it always really voluntary? Grandmothers helping 3 or 10 grandchildren? Pensioners helping their parents? Frank: Voluntary work makes poor! It means that a paid work will be replaced by “voluntary” unpaid or very poorly paid work. If an unemployed person works voluntarily, her/his pension won’t improve. − Should we take voluntary work, its definition and its impact on the job market, paid compensation or “salary” and pensions as a title for forthcoming fringe meetings. − Ethnologists are wondering: during the stone-age people didn’t work more than 6 hours/day. What have we done wrong when we now have to work more? − Would security be a theme for future sessions? It should be certain that one would live decently on the wage and the pension. We all need the right of water. Around 1,8 Million people in Europe had fight as NGO for it. Now the EU Commison had founded some guidelines for right of water. Because water is one of the vital ressources for live quality. We as elderly generation have also to fight for this right, because we and next generations could not live without clean and free water. This right is also on the agenda of „Social pillars“. The members of the International Network for the Analysis of Intergenerational Relations (Generationes) proudly present the most recent issue of the jointly produced compendium “Generations, Intergenerational Relations and Generational Policy”. The layout of the compendium is designed for using it to translate the specific concepts and terminology of research on generations and intergenerational relations from one language into another.